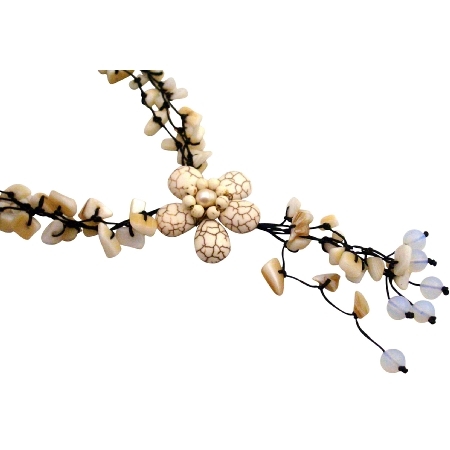 Sophisticated & elegant White Turquoise nugget long necklace 18 inches with White Turquoise Flower with dangling tassel White Turquoise nuggets & White Turquoise beads combo fashionable hang from White Turquoise neckalce. Is one of classiest items in our popular jewelry. Still made in the traditional manner in unique style. Super Grade RARE HIGHEST QUALITY. Quality A to AA. It is the traditional Jewelry.This necklace is very popular gift for someone you love or special. Good shinning surface quality.